While most electronic components benefit from decreased size, antennas—whether in a cell phone or on an aircraft—suffer limitations in gain, efficiency, system range, and bandwidth when their size is reduced below a quarter-wavelength. 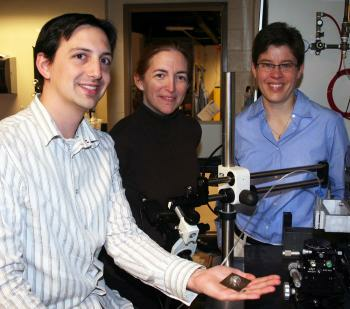 (l to r) Postdoctoral researcher Jacob Adams with principal investigators Jennifer Bernhard and Jennifer Lewis. 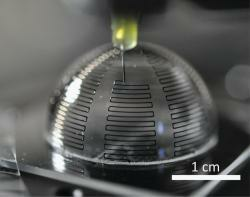 “Omnidirectional printing of metallic nanoparticle inks offers an attractive alternative for meeting the demanding form factors of 3D electrically small antennas (ESAs),” stated Jennifer A. Lewis, the Hans Thurnauer Professor of Materials Science and Engineering and director of the Frederick Seitz Materials Research Laboratory at Illinois. “To our knowledge, this is the first demonstration of 3D printed antennas on curvilinear surfaces,” Lewis stated. The research findings and fabrication methods developed by Bernhard, Lewis, and their colleagues are featured in the cover article,"Illinois Calling" of the March 18 issue of Advanced Materials (“Conformal Printing of Electrically Small Antennas on Three-Dimensional Surfaces”). According to Bernhard, these antennas are electrically small relative to a wavelength (typically a twelfth of a wavelength or less) and exhibit performance metrics that are an order of magnitude better than those realized by monopole antenna designs. “There has been a long-standing problem of minimizing the ratio of energy stored to energy radiated—the Q—of an ESA,” Bernhard explained. “By printing directly on the hemispherical substrate, we have a highly versatile single-mode antenna with a Q that very closely approaches the fundamental limit dictated by physics (known as the Chu limit). Conformal printing allows the antenna’s meander lines to be printed on the outside or inside of hemispherical substrates, adding to its flexibility. Optical image of an antenna during the printing process. “Unlike planar substrates, the surface normal is constantly changing on curvilinear surfaces, which presents added fabrication challenges,” Lewis noted. To conformally print features on hemispherical substrates, the silver ink must strongly wet the surface to facilitate patterning even when the deposition nozzle (100 μm diameter) is perpendicular to the printing surface. To fabricate an antenna that can withstand mechanical handling, for example, the silver nanoparticle ink is printed on the interior surface of glass hemispheres. Other non-spherical ESAs can be designed and printed using a similar approach to enable integration of low Q antennas on, for example, the inside of a cell phone case or the wing of an unmanned aerial vehicle. The antenna’s operating frequency is determined primarily by the printed conductor cross-section and the spacing (or pitch) between meander lines within each arm. According to the researchers, their design can be rapidly adapted to new specifications, including other operating frequencies, device sizes, or encapsulated designs that offer enhanced mechanical robustness. “This conformal printing technique can be extended other potential applications, including flexible, implantable, and wearable antennas, electronics, and sensors,” Lewis said. Contact: Jennifer T. Bernhard, Department of Electrical and Computer Engineering, University of Illinois at Urbana-Champaign, 217/333-0293. Jennifer A. Lewis, Frederick Seitz Materials Research Laboratory, 217/244-4973. Group Photo: Rick Kubetz, Engineering Communications Office. If you have any questions about the College of Engineering, or other story ideas, contact Rick Kubetz, writer/editor, Engineering Communications Office, University of Illinois at Urbana-Champaign, 217/244-7716.